The 42 Series Bariatric Air Mattress is designed for patient comfort and advanced healing. This 42" wide alternating pressure mattress can fit over a bariatric medical bed frame or home care box spring mattress. The extended 42" width gives the patient extra room and provides care takers with a wider surface area to turn and care for the patient. The whisper quiet pump is loaded with features and is designed for prevention to advanced stage 4 healing. The advanced pump features a 10 zone comfort control and includes adjustable cycle times for pain management. The adjustable cycles can change the alternating therapy to 10,15,20, or 25 minute alternating cycles increasing blood flow circulation while preventing and healing stage 1-4 pressure sores. The built in low air loss feature circulates air under the cover. It is designed to keep the patient cool and dry managing moisture and preventing heat build-up. The low shear cover allows the patient to transfer in and out of bed safely protecting the skin from abrasions or tearing. This bariatric medical air mattress is designed with a patented cell in cell design that prevents the patient from bottoming out in the event of a power failure. The 10" air cells are constructed of Nylon/PU for added comfort and support. The top cells "Pillow top feature" prevents head and neck from unnecessary movement during alternating mode. The seat inflation feature increases air flow by 20% to middle bladders to prevent the patient from bottoming out. The top cover is low sheer and waterproof with a quilted back for additional patient comfort. Easily removable and fits in standard washer and dryer. 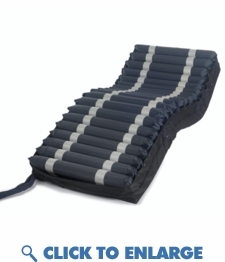 This bariatric alternating pressure mattress is equipped with advanced features for patient safety including audible and low pressure alarms, static float patient transfer feature, and CPR feature for rapid deflation. This advanced bariatric alternating pressure mattress system is the best for patient comfort and healing. Free Fast Shipping. on Bariatric Alternating Pressure Mattress The Bariatric Air Mattress is designed for patient comfort and advanced healing. This 42" wide alternating pressure mattress system can fit over a bariatric medical bed frame or home care box spring mattress. The extended 42" width gives the patient extra room and provides care takers with a wider surface area to turn and care for the patient. The whisper quiet pump is loaded with features and is designed for prevention to advanced stage 4 healing. The advanced pump features a 10 zone comfort control and includes adjustable cycle times for pain management. The adjustable cycles can change the alternating therapy to 10,15,20, or 25 minute alternating cycles increasing blood flow circulation while preventing and healing stage 1-4 pressure sores. The built in low air loss feature circulates air under the cover. It is designed to keep the patient cool and dry managing moisture and preventing heat build-up. The low shear cover allows the patient to transfer in and out of bed safely protecting the skin from abrasions or tearing. This bariatric medical air mattress is designed with a patented cell in cell design that prevents the patient from bottoming out in the event of a power failure. The 10" air cells are constructed of Nylon/PU for added comfort and support. The top cells "Pillow top feature" prevents head and neck from unnecessary movement during alternating mode. The seat inflation feature increases air flow by 20% to middle bladders to prevent the patient from bottoming out. The top cover is low sheer and waterproof with a quilted back for additional patient comfort. Easily removable and fits in standard washer and dryer. This bariatric alternating pressure mattress is equipped with advanced features for patient safety including audible and low pressure alarms, static float patient transfer feature, and CPR feature for rapid deflation. This advanced bariatric alternating pressure mattress system is the best for patient comfort and healing. The built in low air loss feature circulates air under the cover. It is designed to keep the patient cool and dry managing moisture and preventing heat build-up. The low shear cover allows the patient to transfer in and out of bed safely protecting the skin from abrasions or tearing. This bariatric medical air mattress is designed with a patented cell in cell design that prevents the patient from bottoming out in the event of a power failure. The 10" air cells are constructed of Nylon/PU for added comfort and support. The top cells "Pillow top feature" prevents head and neck from unnecessary movement during alternating mode. The seat inflation feature increases air flow by 20% to middle bladders to prevent the patient from bottoming out. The top cover is low sheer and waterproof with a quilted back for additional patient comfort. Easily removable and fits in standard washer and dryer. This bariatric alternating pressure mattress is equipped with advanced features for patient safety including audible and low pressure alarms, static float patient transfer feature, and CPR feature for rapid deflation. This advanced bariatric alternating pressure mattress system is the best for patient comfort and healing. Free Fast Shipping. on Bariatric Alternating Pressure Mattress The Bariatric Air Mattress is designed for patient comfort and advanced healing. This 42" wide alternating pressure mattress system can fit over a bariatric medical bed frame or home care box spring mattress. The extended 42" width gives the patient extra room and provides care takers with a wider surface area to turn and care for the patient. Alternating pressure cycles of 10, 15, 20 & 25 allows clinicians to customize pressure redistribution and skin surface interface. � Low air loss function controls and manages moisture to prevent skin maceration. � 3 alarms; low pressure, power failure, and alternating failure alerts clinicians when preset pressure levels decrease. � Seat inflate increases air flow by 20% to middle bladders to prevent bottoming out. � Static mode allows for easy transfer in and out of bed. � Pillow top feature prevents head and neck from unnecessary movement during alternating mode. � Lock out feature prevents unauthorized changes to the pump settings. � 10� air cells are constructed of Nylon/PU for added comfort and support. � Quilted top cover for additional patient comfort. � Audible low pressure alarms alerts clinicians when preset pressure levels decrease. � CPR pull tab quickly releases air from mattress. Air Volume: 15 liters per minute . � Cycle Time: 10, 15, 20 and 25minutes, selectable..
� Pump Weight: 8.8 lbs..
� Mattress Dimensions: 42�x80�x10�, 48�x80�x10�..
� UL/CSA approved power cord..
� Pressure Range: 20-70 mm Hg..
� Weight Capacity: 650 lbs..